I have a potted gardenia plant and would appreciate your suggestion on the amount of water to feed it, how often, what type and how much liguid fertilizer to use? If using Miracle-Gro, what proportions in the water, how much water each time and how often? I cannot seem to find a definitive answer to these questions on your web-site or any other sites. Thank you for your help. The reason that there is not a definitive answer is because there is not really one. How much water varies, depending on a great many things. I normally tell people that you should be checking (not watering) on a weekly basis for indoor plants. 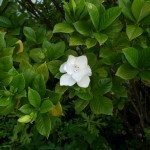 With gardenias, check and see if the soil on top seems almost dry. If it does, the plant needs to be watered. Water until water comes out the bottom. Tap water is fine for most people, unless you have hard water or softened water. If this is the case, it is best to use purchased water. As far as fertilizer, Miracle Gro is fine per directions on the package. Or you can use a slow release fertilizer like Osmocote.